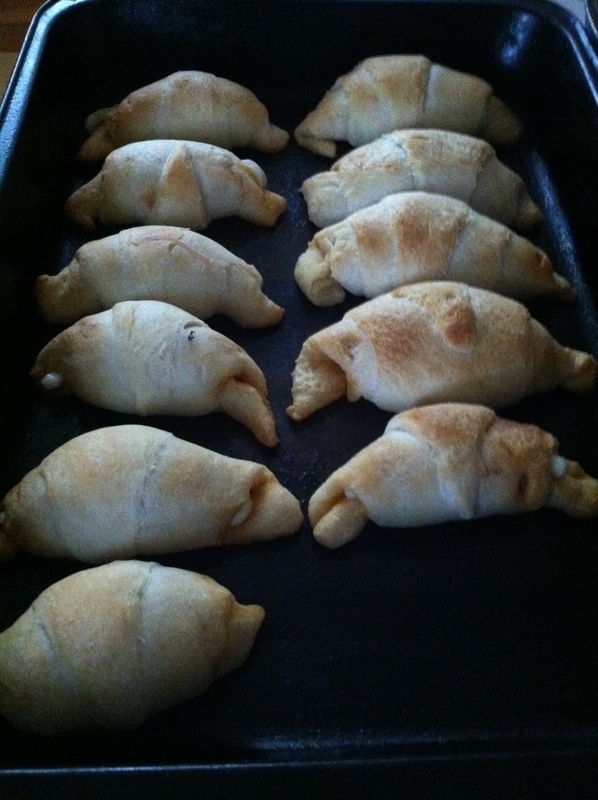 True story, I decided on the last minute to go to a potluck, which meant trying to think up something quick and cheap to make, thus the original to these lovely pizza croissants. This whole thing probably cost me about $15 and 35 minutes or so. Preheat the oven to the temperature on the croissant packages. When you pop open the croissant packages and unwrap the dough, you’ll notice that each croissant is shaped into easily pulled apart triangles. With this recipe, you’re going to take the pepperoni and cheese and place it on the wedge before you start the rolling process. Make sure you roll the croissant loosely and be aware of the size of the cheese, if you put too much in, it will overflow out of the sides. Place the croissant about two inches apart; they will expand while cooking, so do not place them too close together. Cook for about 10-15 minutes.